This is a simple interest loan or investment calculator. Need to know how long it'll take to pay off your car if you pay the minimum? How about if you pay an extra $50 per month? Gives the total paid, as well as the interest accumulated, for each calculation. The program can solve for any parameter, including the interest rate, given the other four parameters. Want to know how much you need to invest to make 6 grand per month at a 4% APR? You can find that, too. There are probably better ways to solve for the different parameters, but I didn't have a pen and paper handy when I wrote this and wanted the solution quickly. Software source-code is available here: ErikInterest-v0.5beta.tar.gz. You will need Qt 4.3 at least. 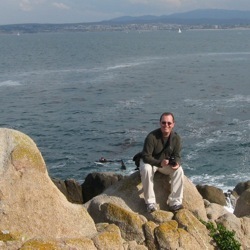 I have tested with Qt 4.3.5 and 4.4 on Mac OS. Your mileage may vary if you use different combinations. Feel free to let me how it works. Using this program is fairly easy. Once you have the program running, you will have five text entries, one for each of 'Present Value', 'Interest Rate', 'Future Value', 'Payment Value', and 'Payment Count'. Enter values for any four of the types and then hit 'compute'; the program will then solve for the fifth. If all five fields have values, the radio button on the right will indicate which value the program will solve for. The 'X' buttons clear the associated field. Erik's Interest Calculator is free software: you can redistribute it and/or modify it under the terms of the GNU General Public License as published by the Free Software Foundation, either version 3 of the License, or (at your option) any later version. 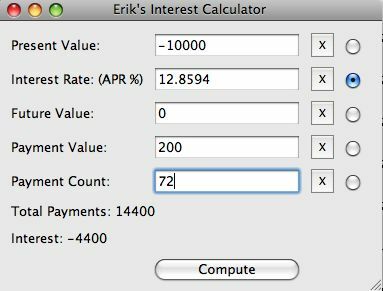 Erik's Interest Calculator is distributed in the hope that it will be useful, but WITHOUT ANY WARRANTY; without even the implied warranty of MERCHANTABILITY or FITNESS FOR A PARTICULAR PURPOSE. See the GNU General Public License for more details. 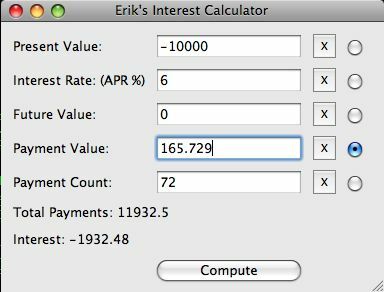 You should have received a copy of the GNU General Public License along with Erik's Interest Calculator. If not, see http://www.gnu.org/licenses/.